I want to put two of my favorite people together in conversation about a topic that dogs us all: Worry. The two people? 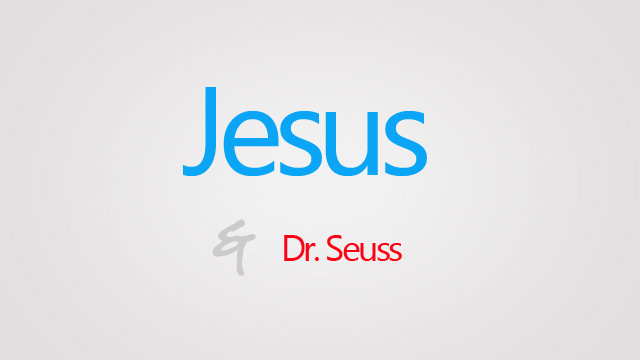 Jesus and Dr. Seuss. Jesus … because, well, he’s Jesus. And Dr. Seuss because in addition to the fact I love him, this week marks what would be his 111th birthday. While most of us think of him as a children’s writer who created great stories with funny rhymes, Dr. Seuss was also a Dartmouth and Oxford educated writer who won two Academy awards, two Emmy awards, a Peabody, and the Pulitzer Prize. So listen up: here are three lessons on worry from some heavy hitters. Lesson #2: Worry is a waste of time. Jesus also asks this heady question: “can any of you by worrying add a single hour to your span of life?” Can we? No. We can’t worry a mistake away. Harsh words or actions, we can’t take them back. And worrying about it simply takes the focus away from what we should be doing – working to move forward and making things right. Nothing productive comes from worrying. Interestingly, the word worry comes from an Anglo-Saxon word meaning to strangle or to choke. We all know what that’s like — that feeling of tightness that comes over us in the middle of the night when we are worrying about something that might happen the next day. Worry can get a strangle hold on us and cut off our emotional and spiritual air. Lilies are some of the most exquisite, stunning things in creation. Yet, on our best day, on our most creative day, we couldn’t make one. Oh we’ve tried – Michael’s craft store has silk and plastic versions, Monet tried to paint them, and the jeweler Harry Winston even created a lily necklace with seventeen carats of diamonds. Not-even-close. Bottom line – humans and lilies are not that different. We are both creatures molded from God’s hands. We are both exquisite and perfect just as we are. Most importantly, we are both loved and we are both worthy. The main difference is that the lilies know it and we don’t. No. A lily is not going to say that. But we will; we will because we just can’t trust the gift we’ve been given – like somehow, God didn’t think through every aspect of how we were made or plan every hair on our head. 3-there is no reason to worry. We are beautiful, beloved children of God. We must have the trust and have the faith that we will be cared for at least as much as the beautiful lilies of the field.